The Queen Alexandra's Royal Army Nursing Corps has served the nursing and medical needs of the British army, their allies, prisoners of war and local civilians since 1854. Though they were then known as the Army Nursing Service and then the Queen Alexandra’s Imperial Military Nursing Service before becoming QA's and forming the corps of QARANC in 1949. Read more about the history of the QA's. 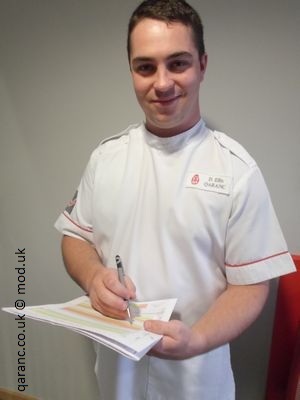 In modern times personnel serve in NHS hospitals alongside civilian staff and at Ministry of Defence Hospital Units. QA's work alongside the army, navy and Royal Air Force (RAF) in field hospitals alongside the Royal Army Medical Corps (RAMC) and with units and battalions with a variety of regiments and corps in the field and in Medical Units at camps throughout the UK and the world. As an example they mobilised in the Field Hospital in Iraq and Afghanistan and the newly created Close Support Hospital (CSH) and Small Hospital Unit (SHU) see QAs near what would have traditionally been called the Front Line providing life saving nursing support. 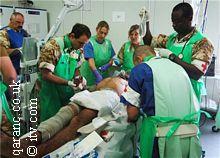 The work of the Medical Treatment Facility (MTF) Helmand Territory Southern Afghanistan featured in the TV programme Doctors and Nurses at War. In the last two centuries a QA may have served in one of the many military hospitals within the UK and overseas in locations like Germany and Cyprus. The oldest surviving military hospital is the Royal Herbert which was redeveloped into luxury apartments and still retains many features of the army hospital. Other former military hospitals have been converted into NHS facilities such as the QEMH Woolwich whilst many remain firmly fixed in the memories of former and serving QA's like the CMH Aldershot. 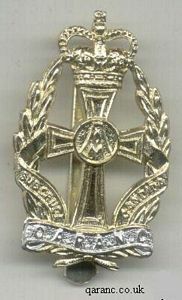 Though many of the military hospitals are now closed the tradition and customs lives on in serving members and much of the historical artefacts are retained and on display at the Museum of Military Medicine and over the years many traditions have been retained such as the QA Motto, the QA and AMS Prayer and the Cap Badge. These have been joined by modern ceremonies such as the Army Medical Services Christmas Carol Service. Since 1902, when the QAIMNS were formed, there have been notable members of the QAs and this continues into the modern day. This includes Dame Maud McCarthy who gave outstanding service during the Boer War and the First World War and Dame Margot Turner who saw active service in World War Two, survived being ship wrecked before being taken Prisoner by the Japanese Army . She survived and had an illustrious nursing and military career and became a Colonel Commandant of the QAs. Five years later the QAs saw war service during the Korean War. Burnt Vengeance - How will a dying patient in a hospice take his revenge? What are his final wishes and what will his solicitor reveal when she reads out his Last Will and Testament? 5-star author C.G. Buswell brings another story from his dark, tempestuous mind. Burnt Vengeance will have you screaming for the light and grappling with your imagination as you try to quell your fear. The QA Association has been providing support and friendship to QAs past and present for over 60 years throughout the world. Through re-unions and events members come together to share memories and make new friends and meet up with old comrades. The QA Association maintains the history of the Corps and keeps records of achievements as well as publishing the twice yearly Corps magazine The Gazette. Read More. 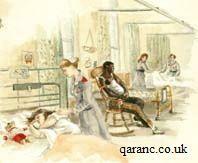 QARANC nurses have and still continue to serve their country worldwide. This takes them throughout the UK and in places such as Afghanistan, Angola, Australia, Belize, Bosnia, Brunei, Canada, Cyprus, The Falkland Islands, Germany, Gibraltar, Iraq, Kenya, Kosovo, Kuwait, New Zealand, Northern Ireland, Rwanda and Sierra Leone. Anywhere the army is deployed then you are sure to find the QARANC. For this reason British Army nurses are highly trained in the latest military and nursing techniques and enjoy a dual role in the army. They are rewarded financially, socially and can gain many nursing qualifications. Read more on the joining the QARANC page. In 2007 a QA Memorial was built at the newly opened National Memorial Arboretum which commemorates the service personnel killed since the Second World War. 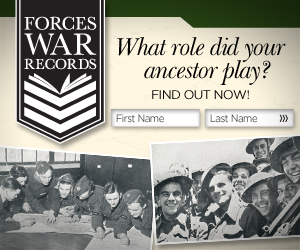 Forces War Records are a genealogy site where you can find military records of over 6 million British Armed Forces personnel cross matched with over 4000 Regiments, Bases and Ships. This link includes a free search and a special discount of 40% off membership offer for visitors who use the discount code AF40 if they decide to become a member. Search Now. A unique feature is their WW1 Soldiers Medical Records section. If you would like to contribute to this page, suggest changes or inclusions to this website or would like to send me a photograph then please e-mail me. We are seeking help with some answers to questions sent by readers. These can be found on the Army Nursing page. © Site contents copyright QARANC.co.uk 2006 - 2019 All rights reserved.